The Crenshaw/ LAX Transit Project has been actively under construction along Crenshaw Bl since January 2014. Over the past few years, major milestones have been achieved in tunnel completion and station excavation. 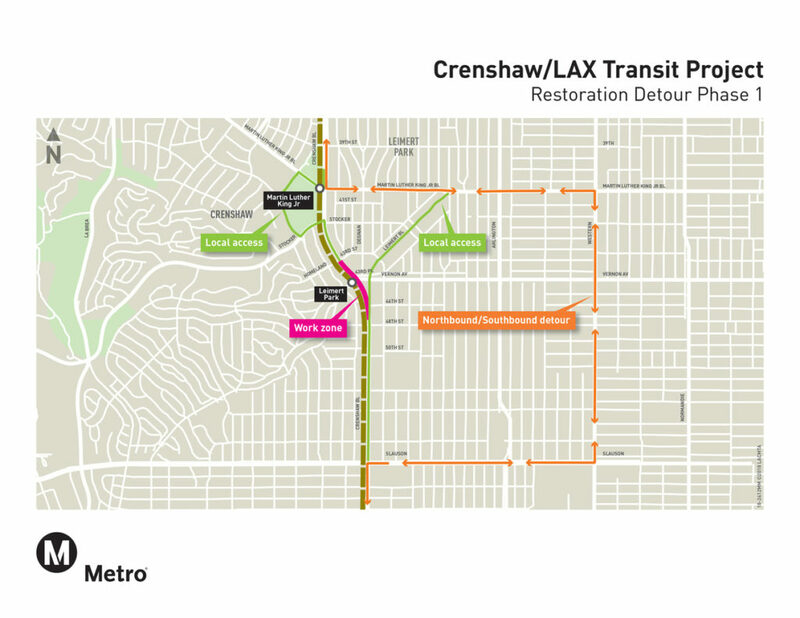 As the Crenshaw/LAX Transit Project gets closer to opening day, fall of 2019, a final phase is necessary to restore the road over the three underground stations along Crenshaw Bl. Restoration will require the removal of the concrete panels lining Crenshaw Bl over each station box. Utilities currently hanging from beams will have to be permanently secured before the road sections are backfilled. Once temporary supports are removed and backfill is complete, the road will be repaved. The last phase of the restoration process will entail reconstruction of curbs, gutters, sidewalks and ADA ramps. The restoration of Crenshaw Bl is anticipated to begin in June 2018. Each phase of restoration will be implemented immediately following the other. 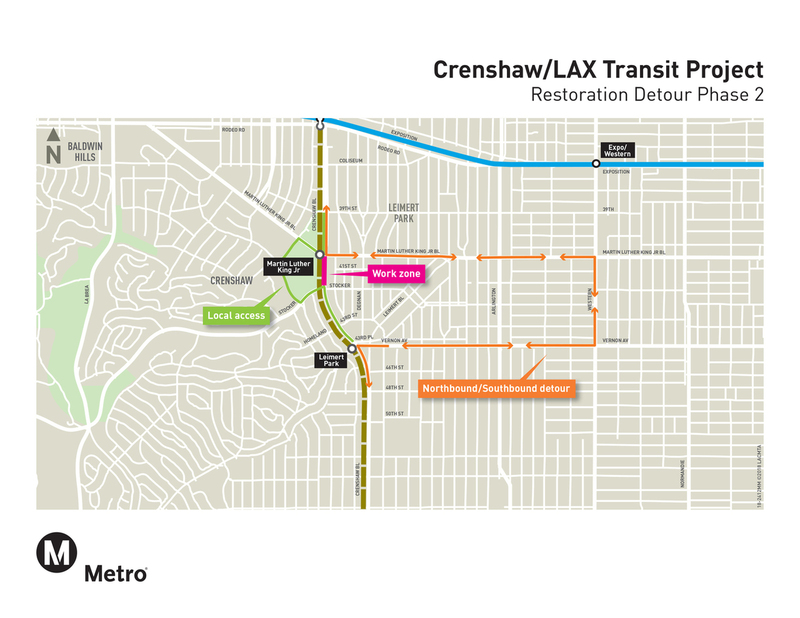 Restoration will begin at the three underground station areas along Crenshaw Bl. Work at each station will be performed separately as three phases in progression from south to north. The first phase will implement a closure at the Leimert Park Station area and the at-grade transition section. This phase will require a closure of Crenshaw Bl from 48th St to 43rd St/Homeland Dr. The closure for the first phase will last 43 days. The second phase will implement a closure at the Martin Luther King Jr. Station area. This phase will require a full closure of Crenshaw Bl from Stocker St to Martin Luther King Jr. Bl. The closure for the second phase will last 23 days. 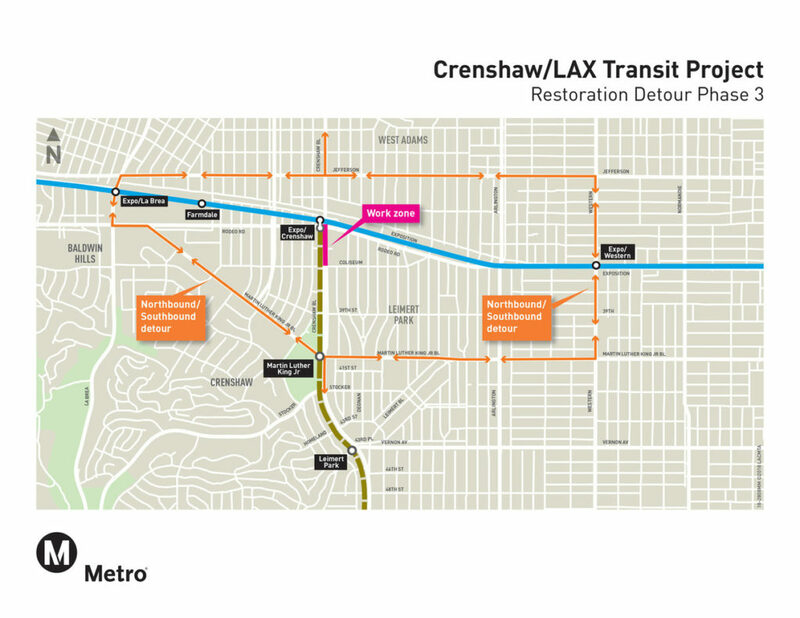 The third phase will implement a closure at the Expo/Crenshaw Station area. This phase will require a full closure of Crenshaw Bl from Coliseum St to Exposition Bl. The closure for the third phase will last 37 days.